For those short on 'board space and keen on computer-based editing, this is an outstanding compact 'verb. Small footprint. Sounds as good as its sibling. TonePrint editing. Limited control on the pedal. Not ideal if you need lots of 'verb options. We first spotted this petite reverb on Guthrie Govan's pedalboard, and now it's available to us mere mortals. 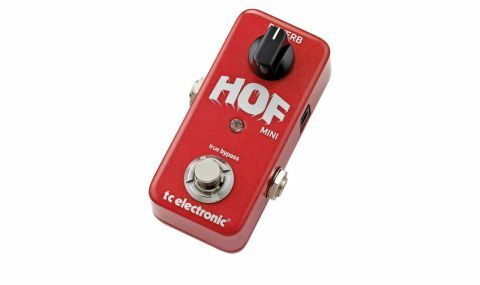 TC Electronic's HOF Mini is one of the most compact reverb pedals on the market - the enclosure's too small to even display the full pedal name! However, that means you get just the one control and mono operation only, while the pedal is powered by a nine-volt power supply. "This is no one-trick pony, though, for the HOF Mini also boasts TC's innovative TonePrint technology"
This is no one-trick pony, though, for the HOF Mini also boasts TC's innovative TonePrint technology. By default, the pedal is loaded with a lush hall setting, but through the use of the TonePrint smartphone app, any of the full- sized Hall Of Fame settings and artist-programmed 'Prints can be beamed into the pedal. Plus, with the recently updated TonePrint Editor, you can connect the stompbox to your computer and create your own TonePrints by adjusting a wealth of hidden parameters, and even assign which parameter the pedal's single knob controls. Like its bigger brother, the HOF Mini's reverbs are exceptional, and with the TonePrint function there are potentially limitless options available, from short springs to an unparalleled range of modulated 'verbs. No matter how high you crank the reverberations the pedal's analogue dry-through ensures your guitar's natural tone still shines through. This isn't the reverb pedal for guitarists who need a lot of sounds on the fly, but if one 'verb will do you for a gig, and you like the idea of in-depth editing using the TonePrint Editor, the HOF Mini is an inconspicuously impressive bijou reverb.